When I first purchased N396DS I noticed when I flew there was a definite bulge at the oil access door. 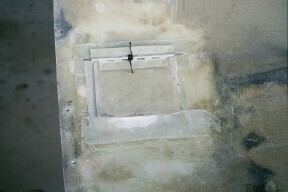 The pressure under the cowl was pushing so hard that a gap was forming around the seal and hold down latch. My friend Rich Jankowski showed me a method that he used and I modified it a bit as shown here. The method used is to make the oil access door swing inward. That way the pressure pushes against the door in flight and causes a very positive seal. You also eliminate the knuckle of the piano hinge. I first laid up 3 layers of glass and resin on the area of the cowl that formed the proper curve. If you have your old door, simply take off the existing hinge, tape the door in place from the inside of the cowl and lay up over the existing door. 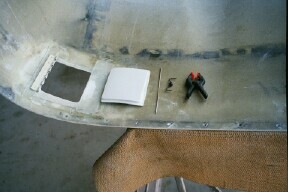 Don't forget to put release tape over the cowl where you are going to lay up the fiberglass. Lay up the glass over a larger area than the existing opening to allow for a new size if necessary. Next, after the glass is cured, lay it over the area where you want the new door opening to be, securely tape it in place and carefully cut the shape through both the new glass and the cowl at the same time. 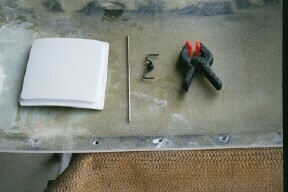 Now you have a perfect fit for the new cowl door and the opening in the cowl. Now reinforce the bottom of the cowl with two layers of glass where the hinge is going to mount. 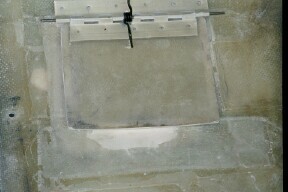 Also lay 2 more layers to the inside of the cowl door larger than the door itself. After this glass has hardened, trim to about ½” all the way around from the already formed door and flush to the hinge edge. I then mounted the hinge to the inside of the cowl using the standard rivet method. The photos show how mounted a strong spring to close the door. Rich used magnets glassed into the door and cowl. I found that even if I didn’t use any closure method the door was in the down position while taxiing but closed automatically when the rpm’s came up. It was kind of funky to see the door drop down on slow taxi after landing. Some people might like this arrangement. I see a lot of owners open their oil access door after landing to let the hot air escape after they park. The spring method I used was to take a spring out of a hand clamp, cut one knuckle out of the piano hinge and then attach it by sliding the hinge pin through the already formed center hole. I then bent the ends up so that there was enough pressure to close the door. As I said before, if the door doesn’t close tight, it will by the time you get airborne. Roger Hirschbein makes/sells landing gear stiffeners and center consoles for RV builders. You can see some of his work HERE.